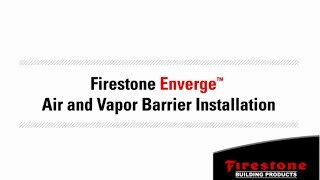 Firestone Enverge™ Air and Vapor Barrier is an asphalt-based, self-sealing wall barrier that provides energy savings and contributes to better air quality for building occupants. Building owners prefer Enverge Air and Vapor Barrier as a sustainable option for their buildings due to the reduced maintenance costs attributed to moisture and thermal control. Engineered and manufactured to create an impermeable barrier, Enverge Air and Vapor Barrier is built to perform for years to come. Minimizes drafts and reduces moisture to guard against mold. Meets or exceeds ASTM D5602, D1876, D903, E283, E96, and E330. Used as a self-adhered weather barrier on vertical walls of masonry, concrete, or gypsum sheathing. Used as a transition membrane at various locations such as doors, windows, and penetrations.